LOS ANGELES (AP) — The tail end of a punishing winter storm system lashed California with thunderstorms and severe winds Monday after breaking rainfall records, washing out roads and whipping up enormous waves over the weekend. A thunderstorm brought ashore hail northwest of Los Angeles in Santa Barbara County, where a tornado warning was briefly issued. No tornadoes were reported but wind gusts topped 60 mph. Flood watches and warnings remained in place for much of Southern California, a day after nearly 4 inches of rain fell south of Los Angeles, flooding roadways, toppling trees and raising concerns about damaging mudslides. Commuters faced a messy drive to work, with rainfall expected to ease slightly but not taper off until Tuesday. Motorists were urged to use caution on mountain passes where heavy snow fell. The National Weather Service warned that the system could be among the strongest storms in years, and it delivered. Long Beach Airport received 3.87 inches of rain by 5 p.m. Sunday, breaking the all-time daily record for rainfall. Los Angeles Airport got 2.78 inches, another all-time daily record. Television footage showed rescue crews sending a raft, which was anchored to a firetruck, into rushing brown water so the trapped couple could climb aboard, one by one, from the car’s passenger window. 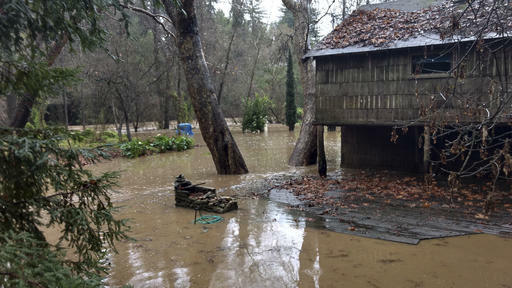 Residents in rural Santa Cruz County south of San Francisco watched helplessly Sunday as the San Lorenzo River spilled over its banks for the second time this month, sending muddy water and debris into yards and homes. No injuries were reported. Traffic was diverted off interstates 110 and 710 south of downtown Los Angeles because of water flowing across lanes. Authorities ordered evacuations near wildfire burn areas in Santa Barbara, Los Angeles and Orange counties. Potential debris flows could restrict access for emergency responders, officials said. Farther north, officials warned of a “high avalanche danger” at all elevations of the Sierra Nevada mountains because of heavy snowfall that has closed several ski resorts. The Sierra Avalanche Center advised Sunday against travel in the area, warning of intense snowfall rates and gale force winds. The San Francisco Bay Area was under a high surf advisory along the coast until early Tuesday with waves of up to 19 feet expected, National Weather Service meteorologist Steve Anderson said. A historic WWI-era ship called the S.S. Palo Alto and docked near Santa Cruz was torn apart by massive waves Saturday. The Bay Area was also under a flash flood watch that continues through Monday and a wind advisory was in effect until late Sunday. Tags: flood, Los Angeles, Science, Southern California, storm. Bookmark the permalink.